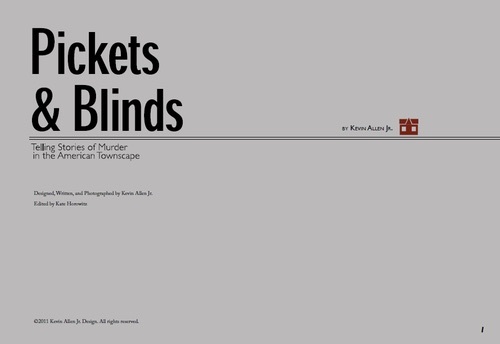 Pickets & Blinds: Telling Stories of Murder in the American Townscape is an unusual sort of RPG and it strays far from what I am typically used to. While I am not new to the horror genre, it is the storytelling, high narrative, focus of the game that deviates from my traditional type of game. This does not mean that it is bad game. After reading the rules through one time I feel pretty confident I could play and even teach the simple mechanics to just about anyone. The game’s premise is simple, formulate the rough details of your character in your mind, no need to jot anything down. The nuances of your character will be fleshed out through the narratives that you will tell when it is you turn. To help flesh out your character, at the beginning of you turn you will draw two cards from what is called the tone deck. These cards will give a “lead” or more simply put, a concept that you need to try to work into your short narrative during your turn. The better you intergrate it, the more points the other GMs will award you at the end of your turn. Following the award of points you will attempt to make a pair with the cards that were set out before all the players at the start of the game. The pairs that you will collect are integral to the game. They are used when other players are telling their character’s story; you can “cash in” the pair by signaling that you want to interject a complication their narrative. The narrator must now weave this complication into their story. As the game progresses and there are less and less cards in the middle the more tense the game becomes. Remember the title, there is something about murder in there and the players narrative ultimately end in murder. Also, throughout play there will a single opportunity for players to attempt to identify, albeit secretly, a lone card that is set off to the side, this is merely for points to help identify a winner. For you see, the one with the most points is not only the winner, but also gets away with murder. During the epilogue turn, each player will then briefly explain how their characters were caught for their murders. The winner gets to explain how their character got away with murder. It it was a fun read and I really think this might be something I will enjoy playing. Seems like it is similar to The Extraordinary Adventures of Baron Munchuasen in that you get to narrate awesome stories while the other players are purposely trying to introduce complications. Even without playing this game, I give it two thumbs up!